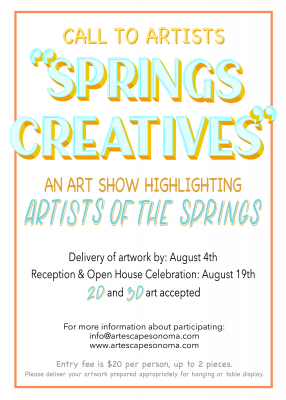 CALL TO ARTISTS: "Springs Creatives"
For artists residing within and near the Boyes Hot Springs area in Sonoma Valley. Artists encouraged to showcase their unique style & passion for the arts. How does living on this side of town influence & inspire you? Submissions also accepted during office hours of weekdays from 1-5pm. Submissions accepted for 2D and 3D work using any medium in whatever way artists choose to display their work. A limited number of pedestals are available. Although this show is not juried we do have a screening process. Please deliver your artwork prepared appropriately for hanging or table display. Entry fee $20 per artist.